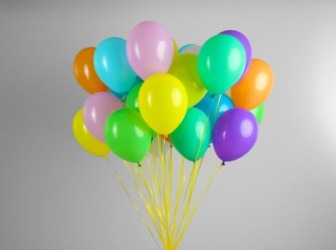 Helium is the gas making these balloons float. Gas is defined as an air-like substance that expands to fill the space it is in. It also refers to a substance used as fuel. An example of gas is helium. An example of gas is the fuel you put in your car to get it to move. The definition of gas is to expose someone to gas fumes, to treat chemically with gas or to give off gas fumes. An example of gas is when you give someone nitrous oxide. An example of gas is when people are exposed to mustard gas in a war setting. An example of gas is when a car exhaust gives off fumes into the air. "gas." YourDictionary, n.d. Web. 19 April 2019. <https://www.yourdictionary.com/GAS>. a condition resulting from indigestion in which such gas causes abdominal bloating, flatulence, etc. Slang to thrill, delight, amuse greatly, etc. a. The state of matter distinguished from the solid and liquid states by relatively low density and viscosity, relatively great expansion and contraction with changes in pressure and temperature, the ability to diffuse readily, and the spontaneous tendency to become distributed uniformly throughout any container. b. A substance in the gaseous state. The speed control of a gasoline engine. Used with the: Step on the gas. A gaseous asphyxiant, irritant, or poison. Slang Idle or boastful talk. Slang Someone or something exceptionally exciting or entertaining: The party was a gas. Phrasal Verbs: gas up To supply a vehicle with gas or gasoline: gas up a car; gassed up before the trip. (uncountable, chemistry) Matter in a state intermediate between liquid and plasma that can be contained only if it is fully surrounded by a solid (in a bubble of liquid) (held together by gravitational pull); it can condense into a liquid, or can (rarely) become a solid directly. To kill with poisonous gas. From Dutch gas, a word coined by chemist Van Helmont. From Ancient Greek χάος (khaos, “chasm, void”). This is common in speech, but rarely used in writing. At the gas station there were only two cars. If you worry about gas emissions from cows contributing to climate change, lobby for a cow that doesn't have gas. Are You Texting What You Think You're Texting?